Here I am, trying on the half-done hat. I think another full repeat of that X-motif will make the hat too tall, don’t you? What shall I do? Another half-rep, and then wing it for the top-decreases? I would rather follow Duckyshepherd’s chart, a tried path, but my desire for a hat I’d like to wear will probably win out here. What can I learn from her chart and apply? Hmmm. 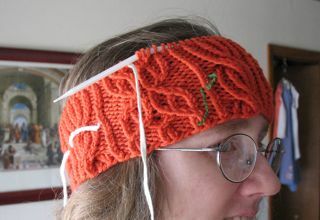 She decreases middle stitches before a cable-crossing . . . , and replaces some twists with same-direction decreases . . . , and sacrifices purls in favor of knits when things get narrow. Perhaps I can DO THIS! I may even try switching to her chart NOW — she includes 5 rounds of pattern before the decreases begin — that’s almost a half-rep. . . . Depends partly on how slowly/quickly she decreases. Hmmmm. I can’t believe I didn’t take photos — I recall *meaning* to. . . . But I made a knitted bunny from the HeartStrings FiberArts pattern (see original on Ravelry here; download pattern from here). Really, I did! From that point, there was a bit of sewing and stuffing, and then more sewing and more stuffing. . . .
Maybe they’ll send me a photo of said niece and said bunny? 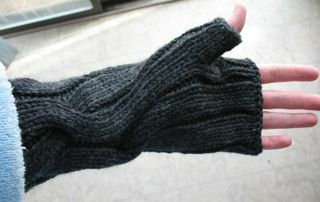 On another knitting front, I delivered the Dashing fingerless mitts yesterday. 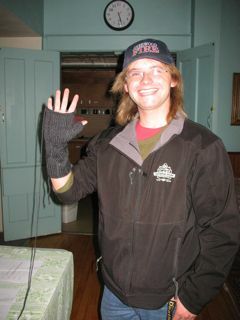 Michael liked them and immediately got to show them off to some mutual friends — one an appreciative fellow knitter (Hi, Jan!). Now for something WITH photos! I’ve been enjoying working on a hat adapted from the Bayerische Sock pattern by Eunny Jang. Here’s another knitter’s cap (Ravelry link) — Duckyshepherd has kindly made available a chart for top-decreasing that I look forward to using. I chose a bulky/chunky-weight wool yarn by Brown Sheep, called Shepherd’s Shades — three 2-ply plies. Color is SS333 “Papaya”. Yarn shows the texture pretty well, eh? LYS employee Val recommended it when I asked for a “firmly-spun yarn for twisted stitch work”. 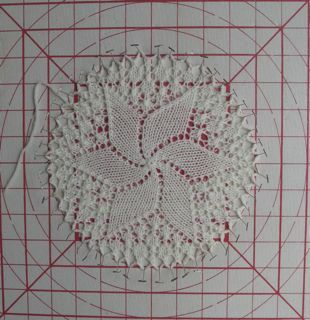 One more round, and I’ll have completed one full rep of the tallest pattern, 2 of each of the shorter (8-round) motifs. After 2 full repeats, the top-shaping begins. This one I actually intend to keep for myself — hope it fits! (Haven’t had the courage to put it on a string/ribbon and try it on yet….) Wish me well. This post will be devoted to discussing various ways to change/customize the Round 1 Sock Madness pattern, Simple Side to Side Socks. I won’t write out the directions for the entire sock, just the changes I’m proposing. Experiment with yarn and needles to find a stockinette fabric you like, worked flat and not in-the-round, firm enough for socks but still stretchy. Measure and divide by # stitches and # rows to get your stitches-per-inch (stitch gauge) and rows-per-inch (row gauge). Write this down! Measure the entire length of your foot, back of heel to tip of toe, and subtract 4.5″ (12 cm). 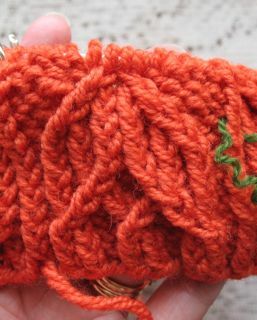 Double this # and multiply that result by your stitch gauge. For instance, a 9 1/2″ foot, minus 4 1/2″ gives 5″. Doubled is 10″ — this is how long your cast-on row needs to be. Multiply by 8 sts/inch gauge to get 80 stitches. 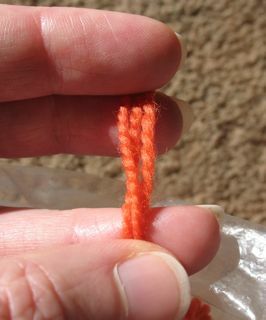 This is how many stitches you want to cast on using a provisional (i.e., temporary, removable) cast-on. I favor crochet-chain provisional cast-ons [video tutorial link here], but you can also use Judy’s Magic Cast On [Jeny’s tutorial link here] and leave one of the 2 sets of stitches hanging on a spare circular needle cable. 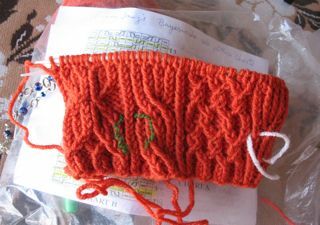 Cast on another 1 1/2″ to 2″ of stitches, counting them in with the leg portion when it comes time to split. Work these extra stitches in stockinette for the first 2 rows, then (4 rows reverse st st, 4 rows st st) repeating to the penultimate row. Make your final row in stockinette — this will make the grafting easier. Your total row count will need to be a multiple of 8, minus 1 — that last “row” will be filled in by the line of grafting. Alternatively, you can group rows in 3’s or 5’s. 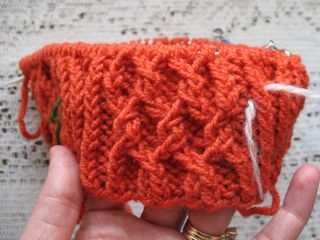 This change avoids the necessity of picking up stitches for the cuff and then binding them off. Measure around the circumference of the ball of your foot, the wide part before the toes begin. Multiply by your row-gauge to get total # of rows around. Work the solid rectangle for the first half of these rows, and the 2 half-rectangles for the second half. This is the simplest tube shape. Several people have been working on this. We all agree it will involve using short-rows to add length just around the middle of the instep portion. The questions have centered around how many rows to add and how long to make them. I’ll discuss our findings, both successful and failed experiments, at the end (see * ). 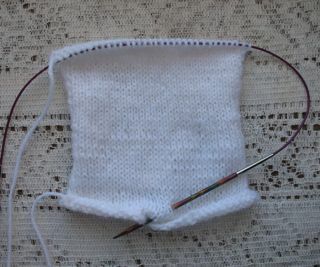 Plan 1: In the half-rectangle that will go around the leg, add short rows along the top, away from the heel. Here is one suggested arrangement. (Since I don’t know which half you’ve chosen to be the leg, I can’t say “knit” (RS) or “purl” (WS); I’ll just say “work”.) After working a few rows, work down 3.5″ from the top, wrap&turn, slip first stitch, work back up to the top. Work 2 rows even, picking up wrap as you pass it. Work 3″ down — 4 stitches fewer than last time — wrap&turn, slip 1, work back up to the top. Work 2 rows even. Work another set of short rows extending 2.5″ down from top, and another set extending 2″ down. You need to finish these rows *before* you get to the center line of the back, then repeat the short rows in the reverse order on the second half of the back. This last will add a total of 1 1/3″ (3.4 cm) to your finished circumference. If you want less, skip the last/inmost set; if you want more, work the short rows closer together to fit the first half of them in before you reach center back. Plan 2: Work the leg half-rectangle straight, but for more rows than on the foot half. Your heel hole will not be symmetrical, so work a round toe/heel instead of a wedge toe/heel — i.e. work decreases evenly spaced at 6 points around the heel instead of only at the sides. Decrease until 6 stitches remain, break yarn, run it through the live stitches and pull it tight. Plan 1: Work short rows at the heel end of the leg half-rectangle, allowing room for the heel without the extra fabric higher up. 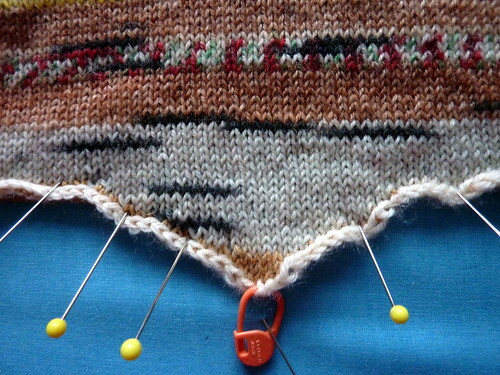 Aim for the heel-ends of both half-rectangles to have the same # of rows, but have fewer rows at the cuff end. Pick up enough stitches to match your stitch gauge: 8 stitches for each inch of edge, for example. 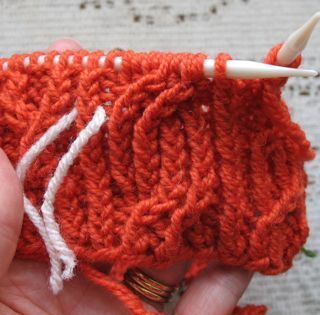 If you can’t get it on over your heel, undo the graft and work a few more rows on the half-rectangles — no amount of last-minute fiddling will change the size of the openings! Work the heel first, then try it on again before working the toe. If the foot-tube doesn’t reach to the tip of your shortest toe, even when mildly stretched, pick up your stitches and work a few plain rounds before beginning your toe decreases. 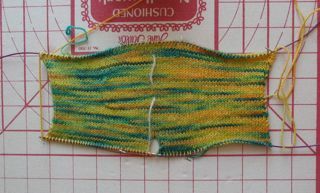 *Short row instep experiments: (I’ll credit the failures if the knitters involved ask me too; otherwise they’ll remain anonymous.) Note that none of these have progressed to the point of grafting shut, so we don’t know how they’ll *actually* fit. Cast on 80 with prov cast on. Work one (RS) row knit. Next row, slip one purl 8, turn. Continue in this way adding 3 more stitches to the short row section until you have about an inch of knitting at the deepest point. (For my tension this was 24st ) Continue as for the main pattern until you reach 4 inches measured along an edge. Then reverse the triangle. Then do the split etc. So far this is looking good, you get a nice neat little triangle of gusset which allows a total of 2 inches of ease, but can be adjusted to suit the foot being knit for. Row 5 Sl 1, K 19 turn, then work back up to the full amount of stitches. Carry on in SS til the edge of the knitting measures almost 4 inches (less two rows) and then repeat the short row sequence. I added too many short rows and did the turns way too close together. First short row row was 30 sts long, centered over where the foot/ankle split would be (cast on 80, knit 60, turn, p 30, turn). Each subsequent turn was done 3 stitches inside the previous one and I kept doing short rows until there were less than 3 sts between the turns. Got a mountain growing over the top of my foot. Stockinette 6 rows. K to center + 8 stitches and turn; slip 1, k15, turn, finish row. Stockinette 6 rows. K to center + 16 sts, turn, slip 1, k 31, turn, finish row. Stockinette to 12 rows from end of instep rectangle. Repeat the short rows in reverse order. This adds 8 rows, about 2/3 inch. Sock Madness has kicked off with my Simple Side to Side Socks pattern for Round 1! It has been really mad, trying to keep up with all the discussion on Ravelry. Lots of questions, several finishers, some complaints, some compliments . . . . On Ravelry’s listing of “new and popular” patterns, this sock has been vacillating between slots #3 and #4 for number of WIP’s. 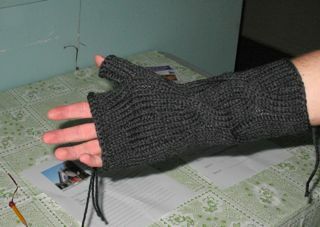 I’d rather write today about finishing the Dashing fingerless mitts. They began around 19 Jan. Intended recipient, young bagpiper Michael Donelson, tried on the first mitt on 13 Feb and asked that the top be narrowed. 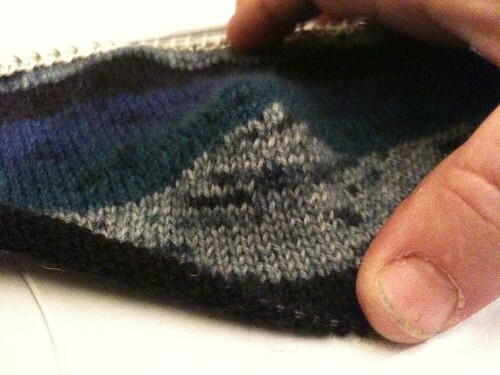 I worked the second mitt differently above the thumb (triangle of decreases) and then altered the first to match it. As of 6 March, both are done and I’m waiting for him to pick them up — with it being so near to St. Patrick’s Day, his pipe bands (yes, plural!) are keeping him very busy. Smile ladies! He's young, talented, and single. . . .
Phew! That was some furious knitting. But Olympic knitting, like the Vancouver Games, is concluded, and the dust is settling. Life and knitting are getting back to “normal”. I went for (my own conception of) the Knitting Triple Crown: medal each in the Lace, Cable, and Colorwork events. And I did it!! 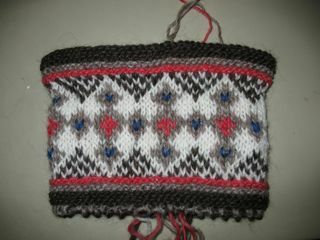 The colorwork began as a hat, but turned out to be not wide enough. 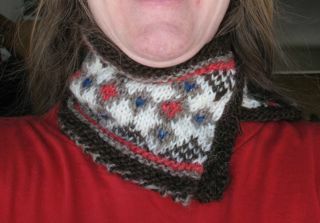 I hand-sewed a steek, cut it open, added edge borders and now use it as a neckwarmer, closed with a plastic hairpin. It’s not as scratchy as I’d feared, and really does work to make me feel warmer. 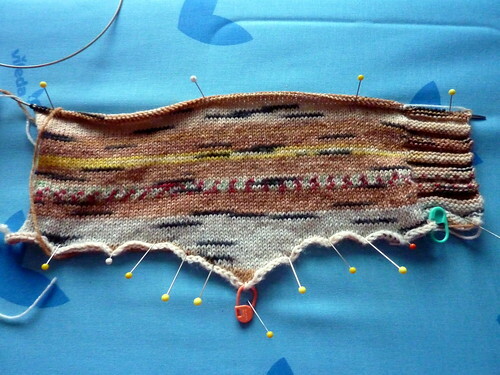 I may do some more swatching to develop this into a full-fledged sweater yoke pattern. . . .
Next up: SOCK MADNESS IV !